One of the best things to do near Dublin is to visit the archeology sites of Bru na Boinne (aka the Brú na Bóinne World Heritage site). When my family recently flew to Ireland for a two-week vacation, we decided to drive the 25 miles (40 kilometers) there from the Dublin airport on Day 1 since we couldn’t check into our B&B until that afternoon. We were exhausted when we got there and refreshed when we left. We all agree it was a fantastic experience — and one of our favorite activities from the entire two weeks! Bru na Boinne includes two major passage tomb sites that you can explore: Newgrange and Knowth. 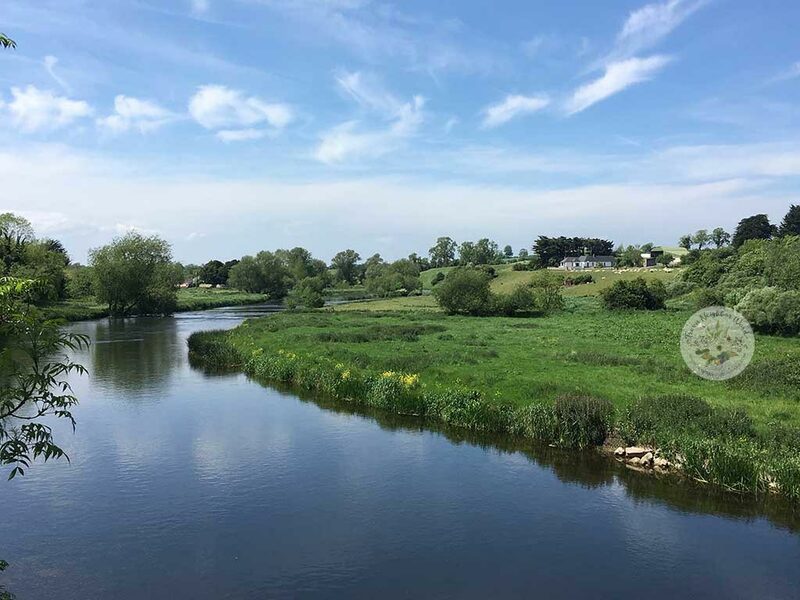 What the Boyne river landscape actually sounds like from the video I made! >>If you want to hear the sounds of this river right in this exact spot, scroll down to watch the video I made. >>Also, check out my Ireland travel guide page. It has lots of useful articles about traveling to and within this beautiful country! Includes details for families traveling with kids, too. Boyne is the name of the river that runs through this area. Other names for Bru na Boinne are “Bend of the Boyne” and Boyne Valley. It’s in County Meath. I didn’t know about Bru na Boinne before we went to Ireland. As it turns out, Bru na Boinne is a hotbed of Stone Age artifacts — in particular, megalithic architecture and drawings — and is revered as one of the greatest megalithic centers in the world. In fact, the Knowth site, which is part of Bru na Boinne, contains one-third of all the megalithic art in Western Europe! Bru na Boinne is also where you’ll find the most famous megalithic “passage tombs” with underground tunnels leading to them. These date back as far as 5,200 years. 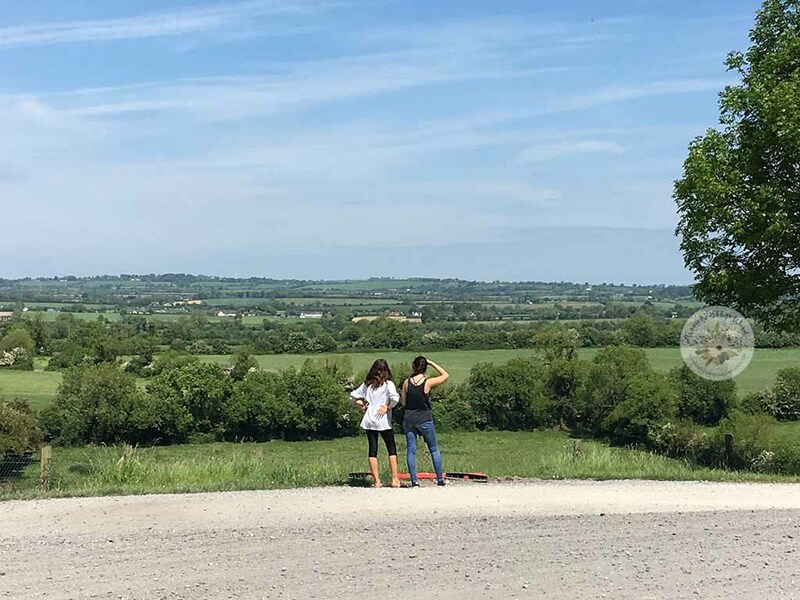 I have to admit: As we sped along the highway from the Dublin airport, I was skeptical that my teenage daughters (ages 13 and 16) would enjoy it. They’d just finished their history finals back in the U.S. that week, and I was sure they were tired of having people tell them ancient facts. But my husband Brian insisted we buy tickets for the guided tours of not just one, but two archeology sites. And so we did! Maybe, I thought, they won’t complain too much. Quite the opposite was true. They were wide awake, curious and excited to explore. The two main archeological sites in the Boyne Valley are called Newgrange and Knowth. My family went on tours of both Knowth and Newgrange. Partly we enjoyed visiting them because the passage tombs are very interesting (who doesn’t love tunnels? ), and the landscape around them is a shockingly beautiful snapshot of Irish farming. It’s almost impossible to believe that Dublin is so closeby. Part of the reason we enjoyed it was that the OPW (Office of Public Works) guides were wonderful at bringing the dramatic history to life. There’s another site called Dowth, where you can wander around alone but can’t enter the tombs. My other daughter Aislin, who is 13, was literally laughing because she enjoyed it that much. I swear to you, at the second site, Newgrange, the girls literally skipped down the hill and jumped up to click their heels in the air! 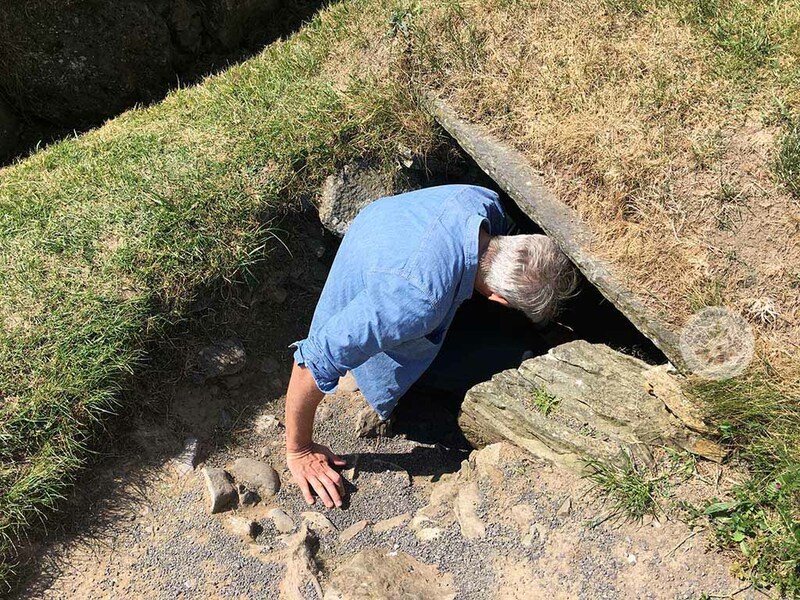 You aren’t allowed to enter these passage tombs on your own, or even to access the sites where they’re located. The ONLY way to see them is by taking a guided tour with the OPW. The Visitor Center is 1.25 miles (2 km) west of the village of Donore, on the south side of the river Boyne. The GPS coordinates are N53.694567 W6.4463. If you’re driving from the Dublin airport take the M1 towards Drogheda, then take the exit for Donore. When it’s time for you to go on your tour, you’ll walk across the river via a low bridge. On the other side of the river, you get to a bus stop where an OPW driver picks you up. The ride takes about 5 to 10 minutes to Knowth and Newgrange. At the end, the bus takes you back to the Visitor Center, where you wait for another bus to take you to the second archeology site if you’ve paid for two tours. When my family went, we had to wait about 35 minutes between our visits to Knowth and Newgrange. So to see both sites we spent about 3 hours total (including waiting for our first bus). You buy your tickets for Newgrange and/or Knowth at the OPW Visitor Center. You can’t buy them in advance, and they’re given on a first come-first serve basis. They limit the numbers of people on tours and they can sell out by early afternoon. If you’re traveling with a group of 15 or more, you need to book well in advance. You can do this by emailing them at brunaboinne@opw.ie or faxing them at Tel. 041 9823071. 8 euros for kids and students. The OPW schedules tours throughout every hour of the day until closing. I recommend getting there early in the day to beat the crowds. At the tourist center there’s a great, large cafe with sandwiches, pastries, tea and coffee, etc. There are also well-kept bathrooms and a nice gift shop with affordably priced handmade wool sweaters, jewelry, and other souvenirs from the area. 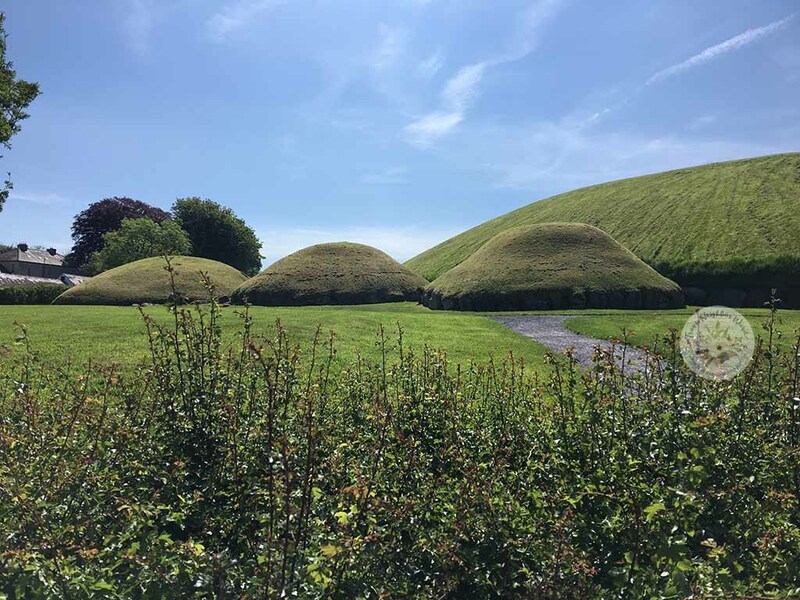 Knowth is open from April 1 to November 1. January – 9 a.m. to 5 p.m.
February-April – 9:30 a.m. to 5:30 p.m.
May – 9 a.m. to 6:30 p.m.
June to mid-September – 9 a.m. to 6:30 p.m.
October 9:30 a.m. to 5:30 p.m.
November-December – 9 a.m. to 5 p.m. The Visitor Center, buses, and all of the tour are wheelchair accessible, except the chambers inside the Newgrange tomb. The Visitor Center has wheelchairs available, and the center is fully accessible. The shuttle buses can take wheelchairs, too. I love hearing your questions and details about your travels.